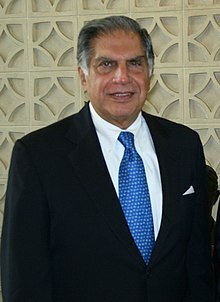 Shri Ratan N Tata was the Chairman of Tata Sons, one of the two promoter holding companies of the Tata group, from 1991 till his retirement on December 28, 2012. He was also chairman of the major Tata companies, including Tata Motors, Tata Steel, Tata Consultancy Services, Tata Power, Tata Global Beverages, Tata Chemicals, Indian Hotels and Tata Teleservices. During his tenure, the group’s revenues grew manifold, totalling over $100 billion in 2011-12. Mr Tata is also associated with various organisations in India and overseas. He is the chairman of two of the largest private-sector-promoted philanthropic trusts in India. He is a member of the Indian Prime Minister’s Council on Trade and Industry. He is the president of the Court of the Indian Institute of Science and chairman of the Council of Management of the Tata Institute of Fundamental Research. He also serves on the board of trustees of Cornell University and the University of Southern California. Mr Tata serves on the board of directors of Alcoa, and is also on the international advisory boards of Mitsubishi Corporation, JP Morgan Chase, Rolls-Royce, Temasek Holdings and the Monetary Authority of Singapore. Ratan Naval Tata, GBE (born 28 December 1937) is an Indian businessman, investor, philanthropist and interim chairman of Tata Sons. He is the chairman of Tata Group, a Mumbai-based global business conglomerate from 1991 till 2012 and again from 24 October 2016 for interim term, and continues to head its charitable trusts. He is the recipient of two of the highest civilian awards of India–Padma Vibhushan (2008) and Padma Bhushan (2000). He is an alumnus of the prestigious Cathedral and John Connon School, Bishop Cotton School (Shimla), Cornell University & Harvard Business School. Ratan Tata is the son of Naval Tata, who had been adopted from J. N. Petit Parsi Orphanage by Navajbai Tata. His parents Naval and Sonoo separated in the mid-1940s when he was ten and his younger brother, Jimmy, was seven years old. Both he and his brother were raised by their grandmother Navajbai Tata. He has a half-brother Noel Tata from Naval Tata's second marriage to Simone Tata. He schooled in Mumbai and Shimla, at the Cathedral and John Connon School and Bishop Cotton School (Shimla). He received a B.S. degree in architecture with structural engineering from Cornell University in 1962, and the Advanced Management Program from Harvard Business School in 1975. Tata began his career in the Tata group in 1961. He started on the shop floor of Tata Steel, shovelling limestone and handling the blast furnace. He could not turn around group companies, NELCO and Empress Mills, which he was given charge of in the 70s. In 1991, J. R. D. Tata stepped down as chairman of Tata Sons, naming him his successor. When he settled down into the new role, he faced stiff resistance from many company heads some of whom had spent decades in their respective companies and rose to become very powerful and influential due to the freedom to operate under JRD Tata. He began replacing them by setting a retirement age, and then made individual companies report operationally to the group office and made each contribute some of their profit to build and use the Tata group brand. Innovation was given priority and younger talent was infused and given responsibilities. Under his stewardship, overlapping operations in group companies were streamlined into a synergised whole, with the salt-to-software group exiting unrelated businesses to take on the onslaught of globalisation. During the 21 years he led the Tata Group, revenues grew over 40 times, and profit, over 50 times. Where sales of the group as a whole, overwhelmingly came from commodities when he took over, the majority sales came from brands when he exited. He boldly got Tata Tea to acquire Tetley, Tata Motors to acquire Jaguar Land Rover and Tata Steel to acquire Corus. All this turned Tata from a largely India-centric group into a global business, with over 65% revenues coming from operations and sales in over 100 countries. He conceptualised the Tata Nano car. As he explained in a recent interview for the Harvard Business School's Creating Emerging Markets project, the development of the Tata Nano was significant because it helped put cars at a price-point within reach of the average Indian consumer.